We’ve been creating events – large and small – for almost ten years now, and we’ve had so many wonderful experiences along the way. We’d like to share some of the special highlights. These range from our Peace Day events to visits by British peace worker Jeremy Gilley and the amazing Jane Goodall, who travels the world speaking on behalf of animals and the environment. We work for peace all the time, but these highlights will give you some sense of this special work we do. Join us at a Peace Flag Workshop or our celebration of the Day/Month of Peace in September each year. Help to create more peace in the world. We are all peace makers. The Peace Flag Project is an arts-based peace organization, and our many beautiful Peace Flags and our wonderful Peace Fest celebrations each fall are a tribute to how art contributes to peace, and how art inspires us about peace. In the Summer of 2015, Cathren Housley, a local artist we’ve been working with, came to us with an amazing project: She wanted to create a huge American Flag (20 feet wide by 10 feet high) that was made up entirely of Peace Flags. Of course, we loved the idea, and set to work to make this inspiration a reality. The first flags for the project were made at our 2015 Peace Fest RI in Burnside Park in Downtown Providence. Since then, more than 350 flags were made by groups of all ages, all over Rhode Island. Peace Flags were made by senior citizens, elementary school students, URI students, Coming-of-Age 8th Graders at First U Church, members of the Chorus of East Providence, and more. The flag turned out to be even more moving and inspiring than we imagined it would be. We now call it The Great American Peace Flag, and it reflects our hopes and dreams for a more peaceful world. We hope you get to see it in person soon. It will be at various events and venues around RI. April 20, 2016 was the night of our very special Peace Flag Project Benefit Concert with Caroline Cotter. The show was a fabulous success. Everything we hoped it would be — and more. So well attended. Very friendly crowd drank Peace Punch, ate cookies and made Peace Flags before the concert and during the intermission. And Caroline was AMAZING !!! Such a lovely voice and great songs — such a variety of styles and subjects. A wonderful musician! A real treat to have her return to Providence. And Caroline was so generous to perform for the benefit of PFP. This concert was our unveiling of our inspiring flag; there are more than 350 flags made by people from all over Rhode Island. 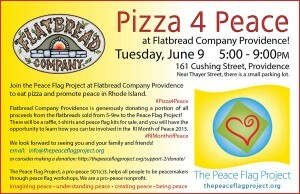 PFP had a wonderful fundraiser at the great Flatbread Company in Providence on Tuesday, June 9. It was an enormous success. We were so pleased by everyone who enjoyed a pizza 4 peace. Thank you so much to all our friends, volunteers, family and colleagues who came out to support us. Thanks, too, to all the wonderful local companies, businesses and organizations who donated items for our Raffle/Silent Auction. Those things were excellent fundraising items, and we are so grateful for their generosity. We couldn’t be happier! Thanks again for all your help and support over the years. To celebrate the UN Peace Day in 2011 and 2012, we began a new and amazing venture – doing our traditional Peace Walk at WaterFire. WaterFire is Rhode Island’s premier community art program that fills downtown Providence with wonderful crowds come to enjoy the burning braziers in the river! Several hundred people walked slowly and in silence through WaterPlace Park carrying Luminaria candles. “It’s an amazing experience to walk peacefully, quietly through all the energy of a WaterFire evening. So inspiring and uplifting.” says organizer Ginny Fox, Director of the Peace Flag Project. At the end of the Walk, clergy of different faiths shared Prayers for Peace. The Peace Walk comes from Buddhist leader Thich Nhat Hahn, but includes people of every age, background and religion. Walking together in peace is also a celebration of the rich diversity of Rhode Island. Our Peace Day Walk joins Little Rhodie with the people of the world who come together to celebrate peace on this special day. Saturday, May 1 was a special day at Roger Williams Park Zoo: Jane Goodall Day. The Peace Flag Project was the only RI organization chosen to be part of the celebration of Goodall’s 50 year career, begun when she went into Gombe Stream National Park to study chimpanzees. Dr. Goodall spent the day at the zoo, celebrating this wonderful Zoo, particularly its Roots and Shoots program, a program she and a small group of children began in Kenya more than 20 years ago. Roots and Shoots has grown to include tens of thousands of young people in more than 120 countries. There are 3 R&S programs in RI. At age 76, this remarkable woman tirelessly travels the world for 50 out of 52 weeks in a year. She is devoted to the fight for the rights of endangered animals and for the environment. She also came to the RI Zoo to honor the important work of Louis Perrotti, RWPZ Conservation Program’s Coordinator, with the American Burying Beetle. It was a most thrilling day. Dr. Jane is also an ambassador for the UN International Day of Peace. For more information, see www.janegoodallinstitute.org and www.rootsandshoots.org. Exciting visit for Providence peace community: PFP Director Ginny Fox arranged the visit of Jeremy Gilley, well-known peace activist and advocate for the International Day of Peace, as part of his tour to introduce his new, free educational curriculum for Grades 6 to 12. Gilley was in the US to also talk about his efforts to make the Peace Day a genuine day of peace and global ceasefire as well as a time for humanitarian efforts. In 2008, for example, 1.8 million children were vaccinated against polio in Afghanistan following an agreement by all parties to suspend conflict in the region for one day. Senator Lincoln Chafee, Teny Gross (Nonviolence Institute), Martha Yager (AFSC, Providence) also participated in the event. Please get more information on Gilley’s organization Peace One Day and the peace curriculum at the website www.peaceoneday.org. To read more about the Community Prep visit check out Community Prep’s Newsletter. Our Peace Day celebration in 2008 was very special to us: It was the first year we did a very large downtown event to honor the UN International Day of Peace. It was a most successful event on a beautiful day in downtown Providence’s Burnside Park. We had performers representing the many national and ethnic groups of RI, tables for peace and related nonprofits, activities for adults and children, and a closing of a Walking Meditation led by clergy of different faiths. Mayor David Cicilline presented the PFP’s Director Ginny Fox with a Proclamation of September 21 as the official International Day of Peace in Providence. These Proclamations are issued all around the world in cities, states and countries to mark this worldwide day of peace. “It’s wonderful to have a mayor who cares about peace!” said Fox as she accepted the Proclamation. This was the first year we did a celebration of Peace Day at Market Place Park, along the river by RISD Auditorium. About 150 people came out, and it was a beautiful and moving celebration. The feeling of peace was palpable after our first Walking Meditation along the riverfront. We were on our way!